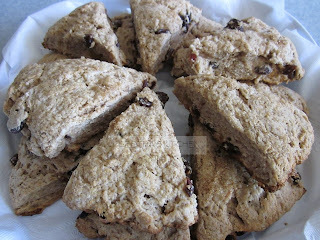 Scones are perfect for tea time; they are also wonderful for breakfast or anytime at all! As they are easy to prepare and bake quickly, they make a wonderful after-school snack too. I adapted this recipe from Sunset's International Vegetarian Cook Book. Using half whole grain flour as well as including almond meal and one of my favorite baking ingredients - oats :-} - increases their nutritive value. Since they already have enough fat, I serve these lovely pastries without additional butter but with an assortment of jams or preserves. They are also wonderful just by themselves with a cup of coffee or tea, especially Masala Chai. For vegan option, use solid margarine and any non-dairy milk. Other dried fruits such as blueberries, currants, cranberries, or other berries or a mixture may be used instead of the raisins. Lemon rind and juice may be used for lemony scones; if using lemon juice you may wish to increase the sugar to 1/2 cup. Combine the flours, spices, salt and baking powder in a sieve over a large mixing bowl; sift together to mix well. Stir in the sugar and almond meal. Cut the butter into a few small pieces and add to the flour mixture. Using a pastry blender or two knives cut the butter pieces into the flour mixture until the mixture resembles coarse crumbs. Sprinkle the zest on top, stir in the oats and bran, and add the juice and milk. Stir well to bring everything together. Turn out onto a floured surface and quickly and gently bring the dough together in a few pats and turns of the dough; handle the dough as little as possible. Divide the dough into half and pat each into a circle about 1 inch thick. Using a floured knife, cut each circle into 8 wedges. Transfer the dough to a parchment lined baking sheet; they can be placed close together but not touching. Alternatively use a lightly oiled baking sheet. Lightly brush the top of each wedge of dough with a little milk and sprinkle a little of the sugar on top. Bake for about 15 to 18 minutes or until golden brown. Serve warm with your favorite preserves or jams. Any leftovers may be stored in an airtight container when completely cool and toasted to reheat. Enjoy! !